Gold futures were higher in Asian hours on Monday as geopolitical tension in the Korean peninsula ramped up following a new ballistic missile test from North Korea. Kim Jong-un’s communist regime launched a new missile on Sunday morning. The projectile flew for about 30 minutes before falling into East Sea waters. 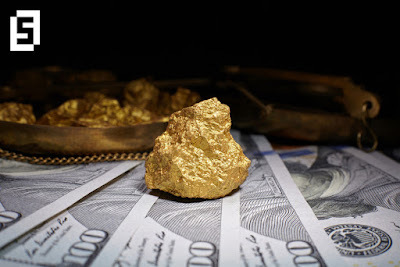 On the Comex division of the New York Mercantile Exchange, gold for June delivery rose 0.30 percent to trade at $1231.40 a troy ounce as of 07:15 GMT. Earlier today, China said industrial production grew 6.5 percent in April, below expectations for a 7.1 percent gain. Fixed-asset investment for the mentioned month rose 8.9 percent, falling short from an expected 9.1 percent build..
Last week, the yellow metal settled higher, with the US dollar extending losses across the board on fears that downbeat inflation data would undermine Fed’s plan to hike rates in June. On Friday, the Labor Department said inflation year-over-year advanced by 2.2 percent in April from a previous month 2.4 percent. Core inflation dropped to 1.9 percent. In other news, retail sales for April grew 0.4 percent, below a forecasted increase of 0.6 percent. According to CME Group’s FedWatch tool, market participants are currently weighing in slightly more than a 70 percent chance of a rate movement next month. Oil prices rose substantially in early morning trades on Monday after Saudi Arabia and Russia confirmed the extension of OPEC-led production cuts until March 2018. US West Texas Intermediate oil futures traded at $48.82 a barrel on the New York Mercantile Exchange, up 2.05 percent from its prior close. The international Brent crude oil futures rose 1.87 percent to trade at $51.79 a barrel as of 07:15 GMT. Saudi Energy Minister Khalid al-Falih and his Russian counterpart Alexander Novak met in Beijing and hinted that the ongoing agreement is likely to be extended beyond June. "The two ministers agreed to do whatever it takes to achieve the desired goal of stabilizing the market and reducing commercial oil inventories to their 5-year average level, as well as to underscore the determination of oil producers to ensure market stability," an official statement said. In November 2016, the Organization of the Petroleum Exporting Countries (OPEC) and independent producers led by Russia agreed to reduce their crude output levels by nearly 1.8 million barrels per day, which accounts for approximately 2 percent of global oil production. The initial deal is due to expire on June and market participants have been speculating for a few months already on the possible renewal of the pact. So far, OPEC reported satisfactory compliance among members. Despite increasing US shale oil production, crude benchmarks have been able to hold around the $50 mark. Declarations from top oil ministers came in days before OPEC meets in Vienna to vote on the extension. Other nations, such as Kuwait, have already expressed support to the iniciative of reducing output levels for a longer period of time. Meanwhile, US producers continued to increase the number of rigs in the country. In the week ended May 12, the total count moved up to 712 units, the highest point since beginning of 2015.